Participants: school students who take folk dance courses and who are not professional dancers. Description – Program: At the beginning of each academic year, the AUB starts folk dance classes for dance teachers who teach in schools. Each teacher has a group of students. The number of students in each group vary between 12 and 30. The groups practice 10 folk dances from 10 different countries of the world. The teaching period starts in November and ends in April. The number of dancers is between 200 and 300. 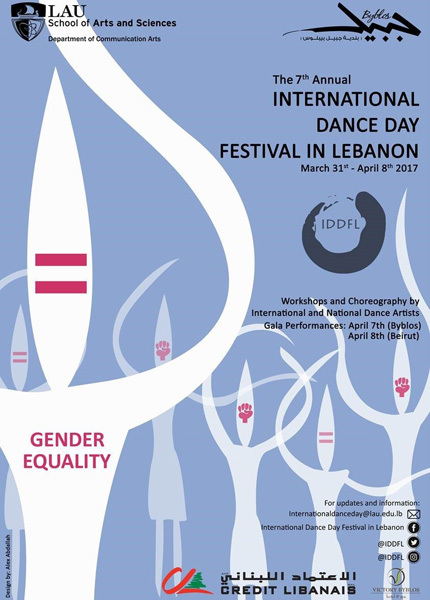 This year The festival is scheduled on the last Sunday of April which falls on the date of the International Dance Day. Every year new groups participate. The objective of this activity is to introduce dance to as many people as possible believing that dancing is for everyone and not only for stages and theatres and professional dancers. Mrs. Marilena Caponis, member of CID (11700) is the dance coordinator and the dance teacher. Ms. Hiba Hemadeh, coordinator of student affairs at AUB. Click here for more details on the schedule of the festival. makes this event special is that it is taught non-paid and the performers are not professional dancers. The objective is merely to enjoy “dance “and get introduced to the different folklores of the world. Every human being has the right to experience the joy of dance. Dance is not only for professionals or the rich or the lucky people who get the chance to do it. The AUB folk dance festival leaves an unforgettable trace of happy moments in each participant’s life.